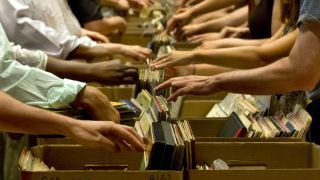 For a true sample collector, nothing beats the feeling of crate digging. No, we don't mean sampling endless YouTube videos or MP3s on your computer, but getting off your behind, hunting down a dusty record shop, wiping off an old, forgotten record, dropping the needle onto it and hearing a crackly old sound that could be the basis for a whole track. If you're looking for an easier way of getting your hands on some classic vinyl-style sounds, though, we have a solution: a ready-made collection of vintage-flavoured loops and hits. The crate digger's samples are divided into seven folders. Six of these are organised by tempo, and there's also a folder of vinyl noises. The crate digger's samples are supplied in a zip file, so you'll need to extract them before you can see them. Enjoy!